Rons Data Cleaner is designed to clean, and/or update, data sources through the use of cleaners and process them efficiently, whatever the size of the files. Cleaners are made up of a list of operations that are selected from a broad list of Column, Row and Cell processing rules. They can be built, saved and applied to as many data sources as required, and re-used with as many Jobs as needed. The Preview window displays both the original data and a preview of the processed data. The result of each rule is therefore very clear and comprehensible. Jobs contain all the detail needed for batch processing allowing 100's of data files to be processed in seconds, making cleaning a whole directory an easy task. 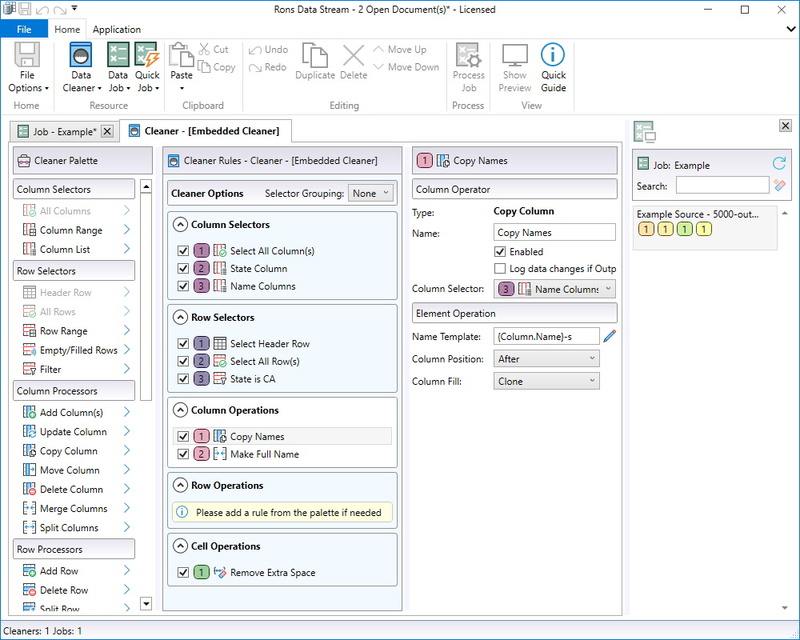 The Data Cleaner handles tabular text formats (CSV, HMTL, XML files and tokenized formats), SQL and Parquet, from loading to converting. More information concerning Rons Data Cleaner can be found on our website: https://www.ronsplace.ca/Products/RonsDataCleaner. The developer welcomes feedback and ideas.